I had a lot of free time last weekend so I had a chance to annihilate stuff by playing another first person shooter game on my Linux box. 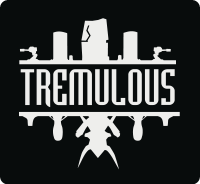 The game is called Tremulous and it's not a typical FPS since it incorporates elements of real-time strategy that makes it even more fun and challenging. 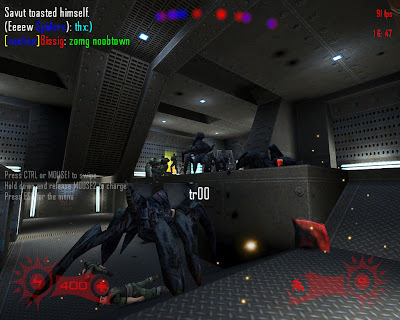 Tremulous started out as a modification of the popular game Quake III Arena. 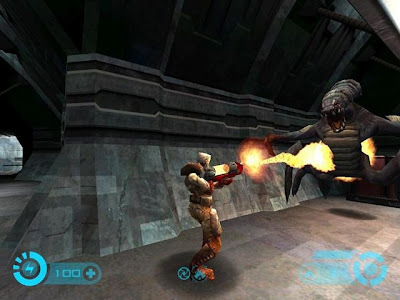 The gameplay is generally inspired by the Quake II modification Gloom, although they absolutely share no content. 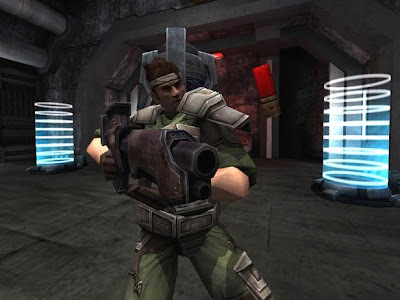 After the release of the Quake III Arena source code under GPL in August of 2005, the developers decided to rework Tremulous into a stand alone, free and open source game. The current version (1.1.0) was unleashed on March 31, 2006 and is based upon the ioquake3 Quake III source port. Though it's been a long time since the last Tremulous release, development is going on for the 1.2 version, which will be out soon. Tremulous is a deathmatch between humans and aliens. Players can choose to be either side with each has its own strengths and weaknesses. They must build and protect a base, which is essential for their survival, consisting of structures that provide various functions, the most essential of which being the ability to respawn. The winner destroys all enemy spawn points and eliminates all members of the enemy team before they are able to rebuild them while the loser is simply annihilated. The humans are technologically well equipped. They start out stronger, but give less damage when using the default weapon. However, the human bases can feature powerful arsenals of turrets that can destroy even the strongest alien species. Humans are rewarded "credits" for every kill or damage that they can give to an alien. Credits are also given every two minutes just for staying alive. The credits are used to buy armor, weapons, tools, etc. The aliens are pesky and fearsome bugs. They have an array of structures, including the main building called the “Overmind”. The aliens begin with low health, but can do plenty of damage. Aliens are rewarded frags for kills, and they use these to evolve into stronger classes, including the deadly tyrant. Like humans, aliens need their stuff to evolve to the next level. Though not the best when compared to today's games, the graphics are quite good with cool particle effects, and nice textures. The accompanying background music and sound effects are just enough to get you all pumped up. The not-so-stunning graphics was not a hindrance for me to fully enjoy Tremulous as its gameplay is really awesome. It's good to know that those with older computer machines can still play a very exciting and like I said challenging fps + rts game as its recommended system requirements are less demanding. I definitely can't wait for the next version of Tremulous. To those of you who want to try Tremulous and are using any of the popular Linux distributions like Ubuntu, Fedora, and Mandriva, it's probably available in their respective repositories so look for it there. Otherwise, you can get it HERE.